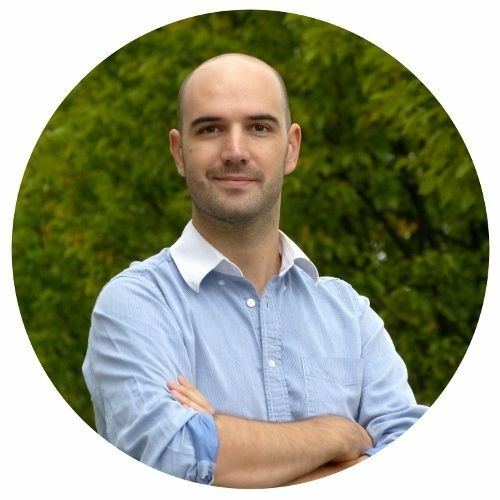 Social media ideas, tips and tricks for hotels. Find in this post 5 social media ideas for your hotel to make the most out of its online presence. If you don’t have one yet, you must create a hashtag for your hotel: #MyHotel. In this brief word or set of words you should reflect your brand name to make it easier for users to mention you in their comments on social media. 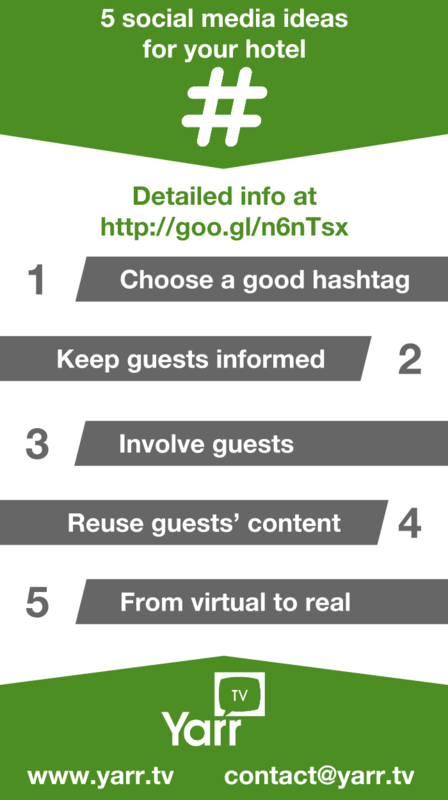 For details on how to create a good hashtag for your hotel, take a look at this article. Use social media to highlight your strengths, for example, the range of activities of your hotel, the attractions of the environment and the quality of your service. Share the table pool activities on Twitter, create an album with the excursions schedule on Facebook, share on Instagram your list of exclusive services… In short, share every single piece of information with your followers so they can better enjoy the stay at your hotel. Invite your guests to leave their stories and experiences in your social media. With a brief comment, a picture and even a short video, the essence of your hotel will be shared and viewed by a large number of people. Use the content generated by your guests to create viral content. Collect this content, create an animated video based on the experience at your hotel and show it on your YouTube channel. A viral video is a good element to spread a brand image closer and funnier; it reaches the customer through humor and emotions, inviting them to share it among their friends. 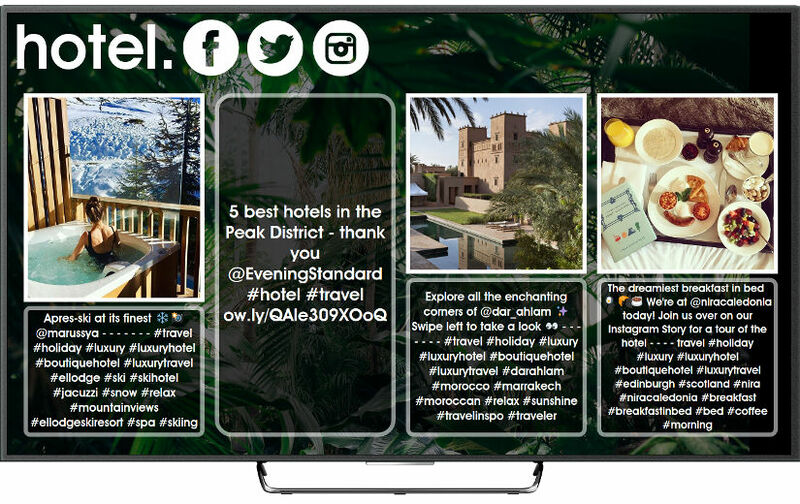 Demo of a social TV displaying tweets and social media photos of a hotel on its screens. We visited the International Tourism Trade Fair FITUR 2015 in Madrid from 28 to 30 of January willing to make it big after exhibiting in 2014. This year, we were presenting the benefits of displaying social media on the lobbies and halls of hotels and supporting Room Mate Hotels and Palladium Hotel Group that were using Yarr TV on their boots. Room Mate Hotels presented the smallest hotel in the world at Fitur and launched at the same time #Selfitur contest that became quickly viral helped by Yarr TV. Palladium Hotel Group was promoting its next opening, Hotel Grand Palladium White Island, using #GPWhiteIsland hashtag and displaying it on a custom Yarr TV wall. Besides, we collaborated one more year with #CenaFiturtech event that took place at Ayre Hoteles Gran Colón. Discover how you to display social media on the screens and events of your hotel with Yarr TV.